Shelves, by their very nature, are simple, plain and functional things. They serve a particular purpose and they do it well, but when it comes down to it, they are pretty boring. You can, however, transform the humble shelf in to an item of infinite and (literally) radiant beauty by creating your own illuminated shelves! No matter what you keep on them – books, photographs, antiques, or a few bottles of your finest liquor – you can give them an extra glow that turns them from bland to statement piece in an instant! Where are you going to put the shelves? What type of material do you want to use? What will the shelves be holding? The best general rule is to plan everything. This way you can eliminate any unforeseen problems and also get the job completed without realising you’re missing a vital component halfway through. Paramount to everything is the type of materials you’ll be using. Melamine, for example, eliminates the need for the kind of preparation process associated with real wood as you won’t need to sand, treat, stain or lacquer it. It’s also worthwhile considering the cost. The whole point of doing it yourself (for most people anyway) is to save a bit of money, so work out an overall budget so you can benefit from the financial savings as well as the finished product. 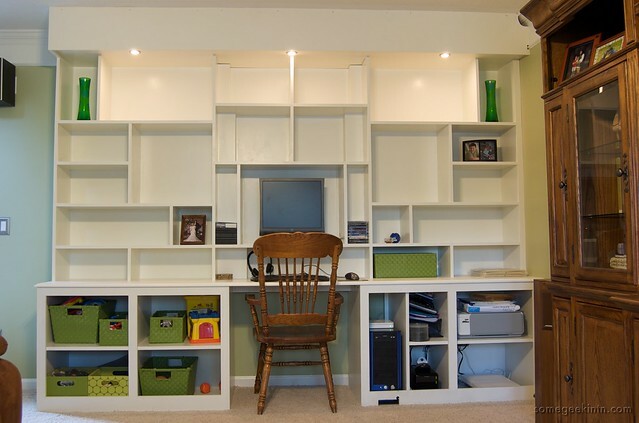 Work out where you want the shelves to be assembled in your home, using the designs and plans you’ve put together. Usually a shelf at eye level works best, in a position where the light bulbs remain unseen but the glow still radiates around the shelves. Also, if you’re going to put bottles or books on the finished shelves, measure the largest of them to ensure they rest comfortably and aesthetically on them. Once you’ve worked out the level, width, height and diameters of the shelves and their intended positioning on the wall and screw the brackets in place, but don’t add the shelves just yet. Choose the lights you want and measure where to drill holes for the electrical cables, so that they can be hidden away inside the wall. Slide or place the shelves onto the brackets and screw securely into place. 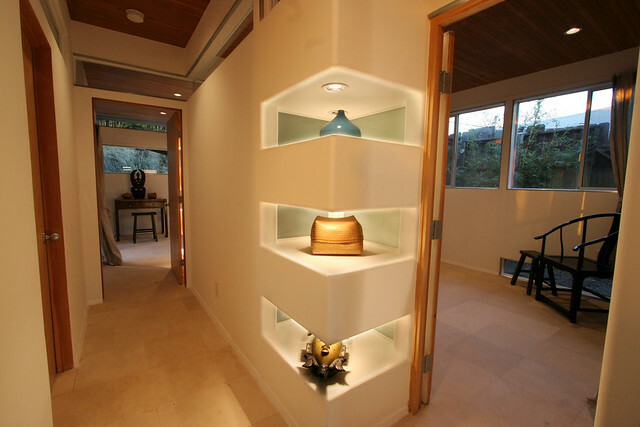 Secure the lights to the shelves using tacks or pins, using their heads to securely position the lights in place. You’ll need to run those electric cables through the wall to the mains and to a switch to turn the lights on and off – this MUST be done by a qualified electrician so don’t attempt it yourself! Alternatively, run the cables through the somewhere inconspicuous and end them with a plug that can be plugged into a wall socket – it’s not such a clean, stylish finish, but if it’s hidden behind your sofa then who cares? So there you go. 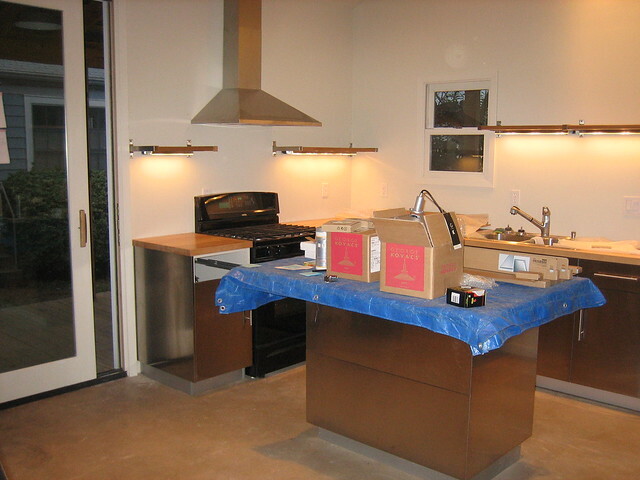 As you can see the construction of the shelves is relatively straightforward – just make sure you’re adequately prepared and equipped and it’ll be no time until they’re up, looking great, and wowing your family and friends. Have you tried to make your own illuminated shelves, and how did you get on? Estelle Page is an interior designer who loves nothing more than a challenging and creative DIY project. Save the planet or save the cash?